BrandAbout is an experiential, do-it-yourself, creative playbook for energizing brands and their product lines and/or services. With 10 practical lessons based on more than 25 years of hands-on, in-the-trenches merchandising and marketing experience, BrandAbout provides companies of all sizes—from startups to Fortune 500s—with more than 40 creative homework exercises that can be customized to their unique needs and applied over and over again. BrandAbout is an adventurous practicum for companies. The main prerequisite is an open mind, an entrepreneurial spirit and a passion for delighting customers! BrandAbout’s inspirational and personal approach is based on Syverson’s real world multi-channel expertise in the marketplace as she encourages companies to collaborate both interdepartmentally, intradepartmentally and directly with their customers. Like a stylized syllabus, BrandAbout is organized into 10 individual building blocks that can be worked through all at once in a self-directed two or three day offsite or integrated individually into weekly or monthly meetings. 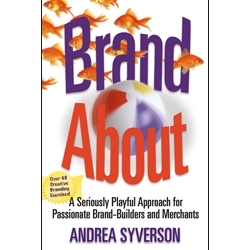 Part Purple Cow, part Whack on the Side of the Head and part inspirational branding guidebook, BrandAbout is actionable, practical and empowering and a must read for creative dreamers and doers looking for a fresh approach to their brand and product challenges. Think of BrandAbout as creative brain food for busy marketers and merchants!